Our old house (100 years old this year -stay tuned for the birthday party!) 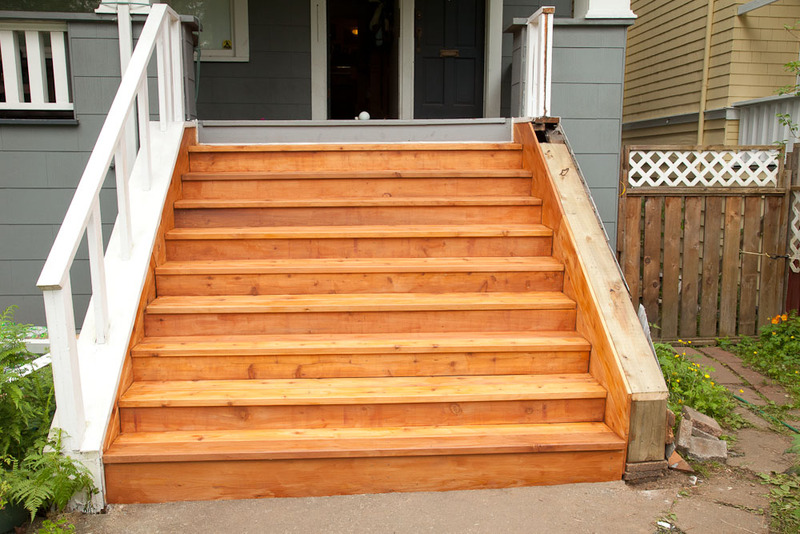 in Kitsilano needed some new entrance stairs. Some of the old stairs were loose and rotted, and the underlying “stringers” of the framework were badly rotted. I’m surprised after looking at them that no one broke through. So, I built some new stairs. It was a big job to tear the old ones apart but the new construction was OK. The biggest job was cutting custom stringers. I used more stringers than the original design, which seemed a bit flimsy, and added a central support pillar. Here’s a photo of the new construction, nearly done. The new framework is (hopefully) rot-resistant pressure treated wood, and the stuff on top is stained red cedar. Looks quite nice, IMO. Ads follow before the comments section. I don't control the ad content, but money flows to me if you click on them.